This recipe is brought to you by Gymnut, home of the best community of top personal trainers. High protein start to the day. The reality: If you believe surveys, more than 31 million American’s skip breakfast because they feel they don’t have time (if you don’t want breakfast that’s another story), and 42 percent of “quick food patrons” would like McDonald’s breakfast for their next morning meal. Healthy breakfasts? They’re just not as easy you’d like, which is why instead of cooking healthy recipes or eating foods high in protein you’re grabbing a sugar-filled granola bar on the way out the door. Your time is valuable, which is why we created a simpler solution. You want quick, healthy meals, and that’s exactly what this high protein breakfast offers. You want quick, healthy meals, and that’s exactly what this high protein breakfast offers. The best part: there’s no cooking involved, whatsoever. 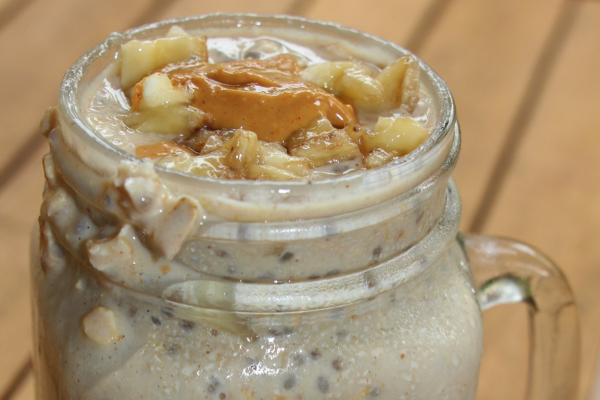 The formula is simple: add the mouth-watering combination of peanut butter and banana to diet staples, oats and protein, and spike it with a few extra healthy foods, and you have peanut butter banana protein overnight oats. The fiber in the oats and the healthy fats in the chia seed and peanut butter will keep you fuller for longer because fiber and fat slow down digestion (this is a good thing). The yogurt adds a creamy thickness that gives a slight tart twist to the sweet banana and the salty peanut butter combination. This is where your taste buds will thank you. Spend less than 5 minutes putting it together in a bowl, and voila you have a hearty, protein-rich breakfast waiting to make your mornings a little better. * Use a vanilla, banana or peanut butter flavored protein powder for this recipe. We used Athletic Greens grass-fed whey, vanilla flavor. Add all ingredients together in a bowl (or mason jar). Mix until combined. Refrigerate overnight. Technically, you only need to 2.5 to 3 hours before it’s ready to eat, so feel free to make this recipe at any time of the day. Drizzle with honey, if desired. This is a repost from Anabolic Minds, to view the original click here.